The Arboretum was abuzz with more than bees this summer. Thousands of visitors walked the trails, admired blooming plants, watched insects flit among the flowers, and caught glimpses of wildlife. Among these visitors were youth attending outdoor educational programs—Earth Focus Day Camp, field trip tours with summer care providers, volunteer work parties, Family Nature Programs, and Grandparents University. At Earth Focus Day Camp, children sought out monarch caterpillars, observed other insects and spiders, and touched a snake. They played games, dug their fingers in the soil, hiked to the pond and prairie, made sketches of flowers and trees, and watched barn swallows swoop in and out of nests. Above all, campers’ favorite activity is Nature Play. During this unstructured time, they catch toads, build stick structures, balance on logs, cooperate with each other, and explore the land around them. One summer camper said, “this is the best part of camp!” It shows in their faces as they enthusiastically run up to a counselor to share a bucket full of discovered items. We watch them solve problems, take risks, and build confidence. 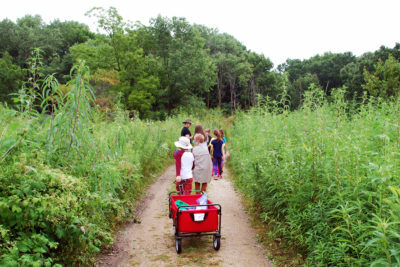 At Grandparents University (GPU), a program run by the Wisconsin Alumni Association, grandparents and their grandchildren attend an Arboretum “course” about Restoration Ecology. They spend time in the Native Plant Garden, Curtis Prairie, and Teal Pond, learning the importance of growing native plants and preserving natural habitat. Using microscopes and hand lenses, they examine seeds and insects to learn about pollination. We even give them a fun introduction to removing invasive species. Tug-a-suckle, a management practice for removing invasive honeysuckle plants, is a cooperative tug-of-war with a rope wrapped around a bush. The goal is to pull it out of the ground, roots and all. The traditional GPU teams are grandparents versus grandkids—the grandkids usually win. We also partnered with the Lussier Community Education Center for an enriching summer program. Their elementary-school group visited the Arboretum on several Monday mornings and we hiked to the pond, watched the turtles and frogs, and caught pond critters. The children studied pollinators and observed all kinds of insects. They also learned to use binoculars. We practiced by focusing on pictures of birds, then wandered through the gardens to look for real ones. The middle schoolers visited the Arboretum for a hike to the pond and prairie, where we discussed the importance of clean water. The high school group participated in a service learning project about invasive species. They learned about different invasive plants and then helped remove them from a restoration in progress. As summer programs wind down and children head back to school, it is satisfying to reflect on everything these young people experienced this summer. We are fortunate to be part of their growing love of nature and happy summer memories. If you are interested in the Arboretum’s youth programming, from summer programs to school field trips to monthly family nature programs for the general public, please contact me.